Also serving communities of Crestwood. There are 15 Memory Care Facilities in the Palos Park area, with 2 in Palos Park and 13 nearby. The average cost of memory care in Palos Park is $5,746 per month. This is higher than the national median of $4,650. To help you with your search, browse the 34 reviews below for memory care facilities in Palos Park. Better rated regions include Palos Heights with an average rating of 4.7 out of 5 stars. Caring.com has helped thousands of families find high-quality senior care. To speak with one of our Family Advisors about memory care options and costs in Palos Park, call (855) 863-8283. Palos Park is located in southwestern Cook County, and it has a population of 4,909, of which 30 percent are 65 or older. This age range is the most susceptible to Alzheimer's, Huntington's disease and other forms of dementia, and up to 11.3 percent of seniors on Medicaid in Cook County, including those in Palos Park, have been diagnosed with Alzheimer's. There are two memory care facilities located in Palos Park and over a dozen more in a 15-mile radius. In Palos Park, memory care is provided by supportive living facilities for those with dementia. These facilities are standalone properties or part of assisted living facilities that are licensed to care for those with memory and cognitive impairments. In Palos Park, seniors don't pay tax on retirement income thanks to the state's exemption. This can help seniors and their families save money for memory care services. At 135 on a scale where the national average is 100, Palos Park's cost of living is much higher than state and national figures, driven mostly by higher housing and transportation costs. This may indirectly impact memory care fees, due to higher operating costs. Palos Park receives 39 inches of rain, matching the national average. However, the city gets 5 more inches of snow than the national average of 26 inches. The city has a typical seasonal temperature variance, with summer highs hitting 84 degrees in July and winter lows reaching around 17. Families of seniors in memory care should ensure that steps are taken to keep residents comfortable during the extreme weather. The air quality in Palos Park is rated 65 compared to the national average or 58. This is good news for seniors with COPD or chronic respiratory conditions such as asthma. Memory Care costs in Palos Park start around $5,746 per month on average, while the nationwide average cost of memory care is $4,800 per month. It’s important to note that memory care rates in Palos Park and the surrounding suburbs can vary widely based on factors such as location, the level of care needed, apartment size and the types of amenities offered at each community. Palos Park and the surrounding area are home to numerous government agencies and non-profit organizations offering help for seniors searching for or currently residing in an assisted living community. These organizations can also provide assistance in a number of other eldercare services such as geriatric care management, elder law advice, estate planning, finding home care and health and wellness programs. To see a list of free memory care resources in Palos Park, please visit our Assisted Living in Illinois page. 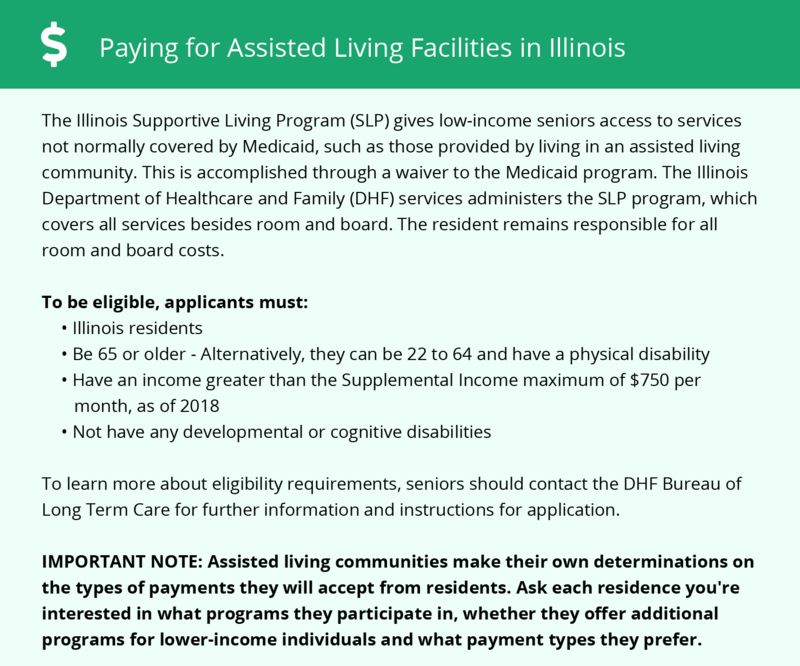 Palos Park-area assisted living communities must adhere to the comprehensive set of state laws and regulations that all assisted living communities in Illinois are required to follow. Visit our Memory Care in Illinois page for more information about these laws.